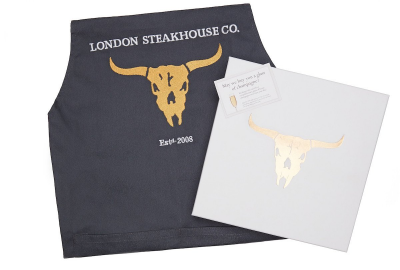 The perfect gift, this beautifully boxed London Steakhouse Company Apron is perfect for him or her. All bookings are subject to availability. Please note there is a 48 hour cancellation policy that applies to all meal reservations, after which time you won't be able to amend or cancel a reservation.Valid every day of the year except Dinner on New Year's Eve & Valentine's Day. Please note that the five-digit voucher code must be quoted at the time of booking with our reservations team or when making your booking online. Additional drinks and side orders that are not included but can be purchased on the day. A 12.5% service charge will be applied to any additional items purchased on the day. Guests may opt to exchange the dining experience for a cash value of the Gift Voucher to spend if they dine from the a la carte menu.